As we begin a new year, I would like to introduce you to an artist who once was widely known and respected. #NicolaesPieterszoonBerchem ( 1620-1683) was a highly esteemed and prolific painter of pastoral landscapes, populated with mythological or biblical figures. It was said that he produced some 850 paintings along with 80 etchings and some 500 drawings. A number of paintings have been re-attributed to other artists. I acquired the etching to the left this past week. It is a fine example of the ‘Italianate’ style which portrays idealised rural scenes, with hills, mountains, cliffs, trees, animals, and peasants. In the top left of the etching can be seen Berchem’s name as well as ‘delin’ followed by an ‘f’. These letters mean that Berchem did both the original drawing of the image as well as the etching made from that drawing. I’m not sure what the ‘e 2’ in the top right corner means but it may relate to which volume and page where it might be found in. Berchem was so good that some of his fellow artists asked him to add figures and animals into their paintings. He also became a respected teacher of painting and a number of his students are well known in their own right. A man who well deserves his reputation as a master artist and who should be better known now-a-days. 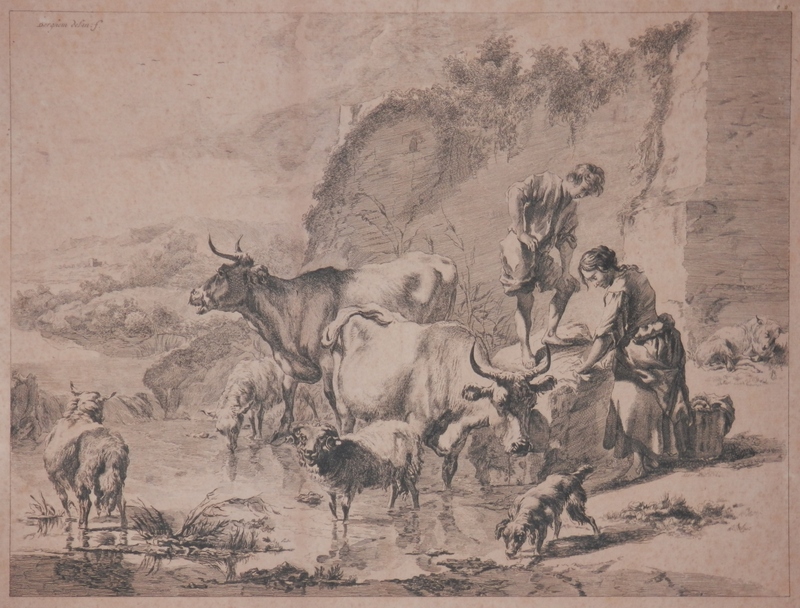 This entry was posted in Etching and tagged cattle, child, cliff, dog, Nicolaes Berchem, sheep, valley, washerwoman. Bookmark the permalink.